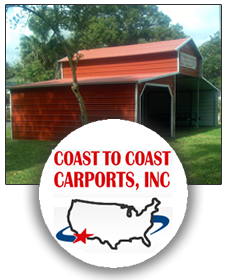 Coast To Coast Carport, Inc. is the top supplier for metal barn homes across the United States. We have locations in many states, including: Idaho, Oregon and Texas, so that we can best serve our clients. We are committed to only using the finest quality of steel when building your home, so that it will be protected from harsh weather, and last significantly longer than a home made of other materials. Our efficient method for creating barn style homes allows us to offer them to you at an affordable price, while still maintaining the quality that you would expect from Coast To Coast. Throughout the entire process, our staff will work closely with you to make sure that your home is created just the way you want it to be. Whether you desire a home that is designed to look exactly like a barn, or a barn home that has a more modern style, the choice is completely up to you. Along with choosing the style of your home, you can also specify the size, roofing, windows, doors, and color. Our metal barn homes have made us a respected company nationwide. By choosing to get a home through Coast To Coast, you are making a long-term investment that will dramatically raise the value of your property. Quality metal homes are a great solution for new homeowners because they are an affordable choice, and you can be closely involved in designing your home. The reason why our company has been so successful is we use the highest standards when building each individual home, and our qualified customer service team is available at all times to address any questions or concerns that you might have.